I am a newcomer to Diana Wynne Jones, reading my first novel by her in the spring of 2011. The book was Dogsbody and Kristen was the one who actually provided me with this gift of work that I had no idea previously existed. Since then, I have read two additional books (The Game and Howl’s Moving Castle), only increasing my love of DWJ’s work. She has the talent to bring magic into a story that leaves the reader spellbound long after the story is complete. In an interview that I recently read with the author (featured at the end of my copy of Howl’s Moving Castle), a specific question actually struck a chord with me that is still reverberating in so many ways. Let me share the full question and answer with you here . . . Doors that open onto many different places figure prominently in Howl’s world. What makes doorways so powerful and mysterious? Doors are very powerful things. Things are different on either side of them. This applies not only to magic portals, where you might find a whole other world when you open the portal, or the kingdom of the dead, or even heaven or hell; but it applies to quite ordinary doors too. Your front door gives you the street (you hope!) and your back door may well give you a garden, and indoors you open a door into another room. But there is always the possibility that it will be a street you have never seen before, a garden that belongs to Bluebeard or someone, or a room that is in some other house entirely. In Howl’s world, since this is a magic world, these possibilities actually come to be true a lot of the time. But there is no guarantee that it is not like this in our own world too. In my home, I always leave more doors open, just to prevent another place suddenly turning up on the other side of them. In the past eight years, I have moved three times and am currently preparing for a fourth and fifth in the next year. In each of these moves, my front door has opened to multiple streets and varying worlds, each in a different state. I have seen mountains. I have seen gardens. I have seen the land of lakes. I have met so many different people and formed friendships. After recently reading Howl’s Moving Castle, I learned that I have been walking across different worlds in my own life, just as he opened his door and walked amongst different worlds in his. And, I have learned that with each open door, there has been possibility sitting right in front of me. Though these upcoming relocations wear heavy on my heart, DWJ made me realize that I need to open myself to the magic of the real world. I need to explore the gardens, submerge myself in the people, and discover the possibilities that lay ahead. 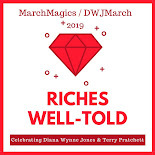 DWJ writes magical stories, but she also does so much more than that. She enchants her readers to see more in the real world, to open our own magical eyes to what may be. There are so many more worlds out there to discover, and I can’t wait to read her tales and see more of the world around me on my own adventures. Thank you Kristen for introducing me to these worlds and to the author who has helped to expand my own! This is only the beginning for me! Tif is a lover of literature, discovering new worlds since the time of her childhood under the sheets with a flashlight. She is a wife, mother of two, freelance writer, advocate of literacy, lover of photography, and passionate about writing in all its forms. She will be celebrating six years of blogging at Tif Talks Books later this year. Topcho ... You're welcome! And, thank YOU!! I have never read Neverwhere, but it is definitely on my list to read!